Melissa Fleming, head spokesperson for the UN Refugee Agency, speaks at Portland’s Healthy Women, Healthy World luncheon. 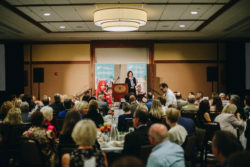 Those were the words of Melissa Fleming, author and humanitarian advocate, speaking at Medical Teams International’s third-annual Healthy Women, Healthy World luncheon, held in Portland and Seattle. Never in modern history has that been more apparent than now, as more than 68.5 million people currently live displaced from their homes, Fleming said. Speaking to more than 700 attendees, Fleming, head spokesperson for the UN Refugee Agency, dug beneath the statistics to uncover the humanity inherent in the plight of refugees. She shared the heroic journey of Doaa, a young Syrian refugee who risked her life to elude war. Doaa’s story, richly detailed in Fleming’s book “A Hope More Powerful than the Sea,” evokes resilience in the face of existential crises. A young woman, working toward a brighter future, Doaa found herself in life-or-death situations outside her control. Doaa’s story underscores common themes running throughout the refugee experience—desperation, resolve and hope, Fleming said. Doaa’s story of becoming a refugee began in the city of Daraa. Protests in the city sparked the flame that ignited the Syrian civil war. Soon, people were dead and tanks had rolled through town. One day, Doaa’s father came home, wheeling his bicycle through the rubble. He announced that a bomb had destroyed his beloved barbershop. With no means to make money, and with no end to the conflict in sight, the family made the difficult decision to leave in 2012. They fled to Egypt, where Doaa worked in a factory and dreamed of furthering her education. She fell in love with another Syrian refugee, who supported her desire to attend college. He said they should go someplace where they’d have a future. He suggested boarding one of the smuggling vessels bound for Europe. They spent all their money to board the rusty, barely sea-worthy boat along with 500 other refugees. After several days into the journey across the Mediterranean Sea, the boat sank. Doaa and her fiance Bassem were among the initial survivors, left to float amid a panoramic expanse of water. After days adrift, Doaa watched as Bassem drowned. She stayed afloat by clinging to an inflatable swim ring, the kind children use in pools. As she was losing hope, two sets of parents swam beside her and put their two tiny children into Doaa’s arms. The parents pleaded with her to keep the children safe before succumbing to the sea. Survival took on new importance for Doaa. She had to save the lives of these orphans. As they all floated in the quiet sweep of water, she sang to them and prayed. After four days, a merchant vessel rescued Doaa and the remaining survivors. Of the 500 people on the boat, only a couple dozen remained—including the children. Doaa had protected them under her thin jacket while they all floated, clinging to the ring. Highlighting Doaa’s determination, Fleming asked, “Why do refugees take these risks?” It’s not because they want to, she said, but because they often have no other choice. She quoted Somali poet Warsan Shire: No one leaves home, unless home is the mouth of a shark. Doaa is one of many. Too many. While she now lives in Sweden with the rest of her family, most Syrian refugee families subsist in settlements in nearby countries. Because of that, the vast majority of refugees are in developing countries, Fleming said. The refugees and these fragile countries need our support, she added, because every refugee has a story to tell. Every life matters. These lives are what you see before the tears have dried. Healthy Women, Healthy World champions women to be global health leaders in their communities. The program connects people interested in learning about the health challenges of women around the world and developing solutions for change.